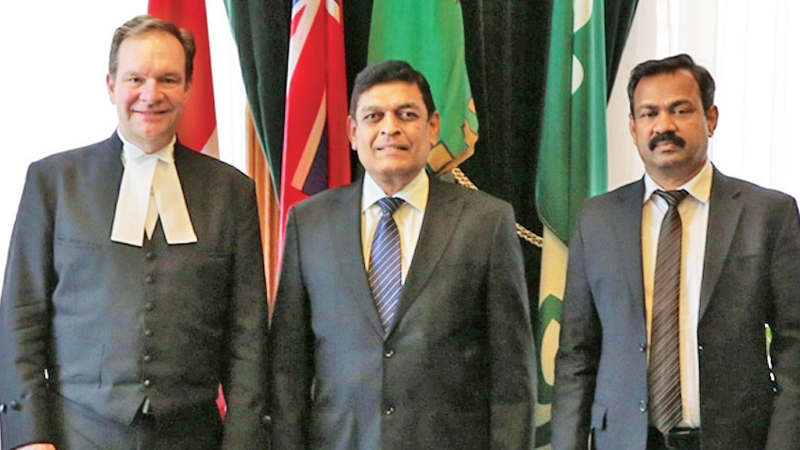 High Commissioner M. A. K. Girihagama with Speaker of the Legislative Assembly of Ontario, Ted Arnott and official. Sri Lankan High Commissioner in Canada M. A. K. Girihagama called on the Speaker of the Legislative Assembly of Ontario, Ted Arnott and briefed him on the recent developments in Sri Lanka and the long-standing bilateral relations. The meeting took place on March 28 at the Legislative Building in Ontario. He referred to the on-going reconciliation process in Sri Lanka and development assistance provided by Canada in this regard. Speaker Arnott thanked the High Commissioner and assured him of Ontario’s engagement on issues of mutual interest. The High Commissioner and the Speaker also agreed to continue working towards further enhancing bilateral ties between Sri Lanka and Ontario. Following the meeting with the Speaker, the High Commissioner also held discussions with Rev. Pastor Marc Dissanayake and the Board of Trustees at the Christian Ministries International followed by a meeting with the President and Chief Priest Vijayakumar Kurukkal and the Board of Trustees of Varasiththy Vinayagar Hindu Temple. During his interactions with religious dignitaries, High Commissioner Girihagama explained the reconciliation process and the initiatives taken by the government in this regard. On March 29, High Commissioner Girihagama called on Chief Priest Ven. Ahangama Rathanasiri Nayake Thera and the Board of Trustees of Toronto Maha Vihara followed by a meeting with Ven. Kulugammana Dhammawasa Thera, the Chief Priest and the Board of Trustees of West End Buddhist Temple and Meditation Centre at the Mississauga Temple. The High Commissioner explained to the Ven. Theras and the Board of Trustees, the initiative taken by the government in making the Thripitaka a World Heritage and the action taken by the High Commission and the Consulate General in creating awareness among those living in Canada in this regard. Thereafter, High Commissioner Girihagama attended the Women in Management (WIM) Awards ceremony as the Chief Guest at the Grand Cinnamon Banquet and Convention Hall in Toronto. The awards ceremony was held for the second consecutive year in Canada, following the inception of the awards in 2011 in Sri Lanka. The High Commissioner who was accompanied by his spouse, Sudarma Girihagama, was warmly welcomed by the organizers on arrival. On March 30, High Commissioner Girihagama held a breakfast meeting with the Lead Priest Moulavi Sheriff Niyaz and the Board of Trustees of the Sri Lanka Islamic Foundation (SLIFO) at the Masjid Al Jannah in Scarborough, followed by a meeting with the Trustees of Sailan Muslim Foundation. During the meeting, the High Commissioner appraised the gathering of the initiatives taken by the government to foster religious harmony. The High Commissioner also discussed issues of mutual interest with those present.